Monetization for quick online income has introduced affiliate marketing as a highly preferred strategy for passive online income. But does it really work for all? Not exactly! 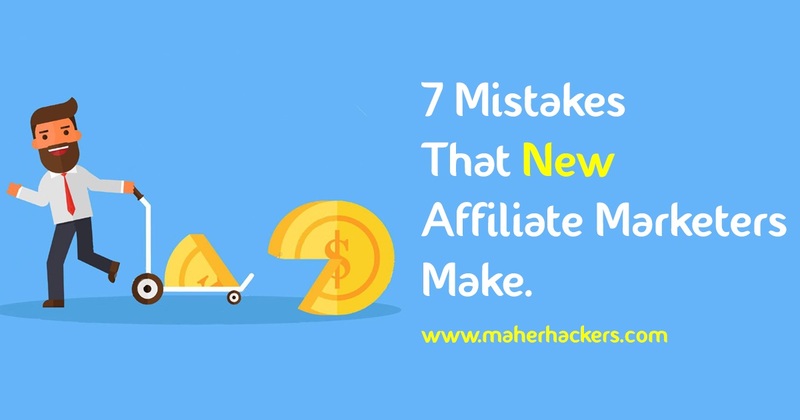 If you are also thinking about becoming an affiliate marketer, you need to avoid the most common mistakes, which the experts overlook when describing affiliate marketing as a promising money-making option. In this post, I’m going to discuss the most common mistakes in affiliate marketing that are not restricted to the beginners only, but, at times, even the experts tend to overlook. Longing for money isn’t a sin, but you need to realize the fact that you don’t become a millionaire overnight. If someone tells you that affiliate marketing is one of the best ways to become rich overnight, just stop listening and look for an expert in the field. It is going to take time, some months or even a year or two. It depends on how you implement the right strategies at the right time. You try different things, learn from failures, and this is how it should work. The key is to avoid repeating the mistakes. Learn the lesson and keep working hard. Sometimes, the beginners are so enthusiastic that they don’t even want to hear the truth. Such daydreaming is the most common mistake and it results in quick disappointment because you get to know the truth with the passage of time, but you don’t want to acknowledge it. Consequently, you simply quit and look for something else. We really want to earn $100 a day, at least, but don’t want to spend a cent to get things organized. Most of the beginners look for free hosting, free subscriptions, free themes, free plugins, and free publicity. They love spending $10 to access the latest movie on the internet, but they don’t want to spend less than $5/month for a reliable hosting platform, which a blog/website really requires for success. Free trials, demonstration, and offers aren’t going to serve the purpose. Consider affiliate marketing as a promising business or don’t even try it. It is just like opening an outlet. If you are not ready to invest in quality, you’ll not manage to achieve any results. It doesn’t cost more than $100 a month to start a top-notch affiliate marketing blog or website. This investment helps you manage everything properly and attract more visitors to your page. They tell you it’s “get rich quick” technique. Often, they try to grab your attention with high pitched claims, for instance, “earn $1000 a week with 0 investment” or “make $1000 while you sleep”. Well, to be honest, there’s no reality behind these claims. Such Guru’s often trap you in their MLM funnel, and you end up being ditched by a pyramid scheme. These things promise everything beyond imagination, but once you follow their instructions, you start wasting your time and energies. There are guest bloggers who propagate just about everything; in reality, they don’t even know the basics. They don’t have practical experience. They simply take material from here and there and reproduce it in a new packaging. The truth is, affiliate marketing requires time, planning, and some investment. If you don’t construction your blog or website in an appropriate manner, you can’t expect results. Whatever you do in your life, you learn from your experience. Failure is the only thing that teaches you the best lesson. When you fail, you actually discover a way which doesn’t work. With so many factors involved, anything could go wrong, so there is no need to get disappointed. It just helps you learn new things. If you don’t believe in “trial and error” then you better stay away. There are no hard and fast rules, if something worked for me, I can only recommend it to you, but there is no guarantee that it’s going to work for you. Everybody learns the dynamics of his/her business, target audience, products, and purchasing behavior. You can’t take an exception as a rule. Be consistent, keep trying, avoid repeating mistakes, and hope for the best. Hard work, devotion, and consistency are the prime ingredients for success as an affiliate marketer. Successful affiliate marketers have a history of failures. They didn’t become rich overnight, they kept accepting the ground realities, trying different ideas, and learning from their mistakes without losing hope. Beginners often don’t like to promote themselves through their website, YouTube channel, blog, and social media accounts. The truth is, affiliate marketing works when your audience knows your background and knowledge about the products/services you are trying to sell. This is why you need to let people know why they should consider your opinions and recommendations. Don’t restrict yourself from letting your audience know that you are an affiliate marketer. Moreover, when your readers know you, they want to communicate either via comments, social media, or email. Furthermore, once you start communicating with your audience, you become more and more confident. Your audience leaves feedback about your blog. It helps you make further corrections and know the preferences of your audience. One of the most frequently committed mistakes – even the experts can’t avoid it at times – is to monetize your website/blog in the first instance. Most of the new affiliate marketers want to first know where the monetization button is. Money prevails, and it is understandable why most of us look for instant monetization. But, it works the opposite way. You first need to focus your blog’s content. Let people become familiar. Let them know who you are and what the blog is all about. It may take a couple of months. Once you manage to attract at least a thousand visitors per week, you can start thinking about monetization. This is a huge advantage of affiliate marketing. You don’t need millions of visitors as you need in the case of AdSense. Why avoid monetization in the early days? You start thinking more about spreading affiliate links across the body of the content. I know some new bloggers who even start including affiliate links in the comments box. It really diverts your attention. During the early days, you need to concentrate on helping your audience to get familiarized. If you distract them straight away with affiliate links, they’ll run away and you’ll struggle with bringing in more visitors. Recall the rat-catching adventure you ever participated in. You don’t chase the rat because you can’t outrun this tiny creature. Same applies to making money from affiliate marketing. Just as you prepare a strategy to catch a mouse, you need to prepare a strategy to promote the products you want to sell. You need to attract money, just like you need to attract a mouse to step on the trap. If you don’t want to re-invest, your affiliate marketing business will not grow. Just like any other business in the world, you need to re-invest. This is the only way to grow your business. If you earn $100, try to re-invest at least $50 and it will hopefully earn you $150 through the next month and it goes on. Reinvesting will ensure growth in the long run and you may become one of the top-selling affiliate marketers in four to five years. Remember, affiliate marketing requires you to write for your audience. At times, even the professionals commit this mistake of including too many keywords in their content. You must focus on a specific set of keywords that are actually related to the content of the blog. Bloggers have this habit of coming up with tricky and misleading titles. The visitors keep reading in an anticipation that the blogger will come to the point at some stage. In the end, the whole post keeps beating around the bush. Yes, you achieve more number of visitors this way, but you do it only at the expense of your audience’s confidence in your blog. Decreasing trust is the nightmare for any affiliate markets. It is highly important to value your audience. Your earning depends on the level of trust and credibility. It doesn’t really depend on the number of visitors. Yes, traffic is vital, but not at the expense of credibility. Affiliate marketing works like a local outlet or a store. People visit you and hope that you’ll guide them in the best possible way. They trust you in an anticipation of making the best purchasing decision. They seek your opinion before spending hard earned money. You need to think like a reliable seller, a guide, and a trustworthy product/service expert. Don’t think of becoming rich overnight, just think of how you can serve your visitors. Once you manage to win their confidence, your visitors will never disappoint. Previous Post: Does Advertising Really Make Money for Your Blog? Bluehost is the Best Hosting Provider. We love Bluehost. Read our review. GoDaddy Hosting Review: Why You Should Just Stay Away! Bluehost Vs JustHost: Which Hosting is Better For You? MDDHosting Vs SiteGround: Which Host is Better? WP Engine Vs SiteGround: Which is a Sensible Choice? SiteGround VS WPX Hosting: Which one is the best choice for you?